In deserts, caves, tents, honed structures and modern buildings over 3300 years the same cantillations have been used to express the words of Torah - the book of Jewish ritual and law. Many distinguish the 79,847 words or 304,805 letters of Torah, but four rarely used, unique tunes (tropes) characterize stand out words and phrases. Why these? 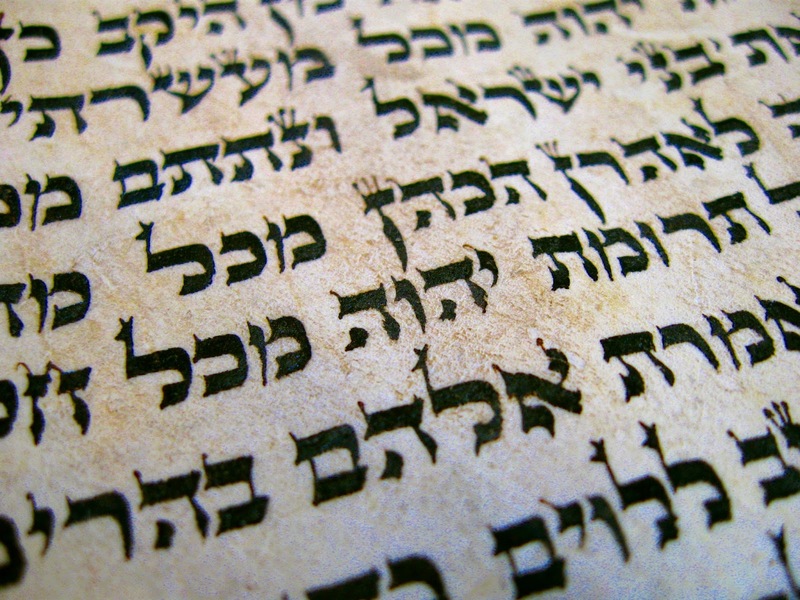 Two cantillations known as Yerach ben yomo and Karne Parah appear once each in the entire Torah and once each in the Book of Esther, which was written 1000 years later. Yerach ben Yomo in Numbers 35:5 on the letter “peh” of the word Alpayim (אלפים, two-thousand) is followed by an equally exclusive Karne Parah on the letter “mem” of the word B'amah (באמה, cubit) in the first of four occurrences of this phrase in the verse. In the Torah’s weekly reading for Masei (Numbers 35:5) these cantillations are made in the verse that instructs how much land must be set aside for the Levites who were not recipients of tribal land, but were gifted residential land near the temple. The Torah instructs Israel to measure off two thousand cubits outside the town to the east, south, west and north side, with the town in the center:- This will be the Levite’s grazing land. The unique use here may emphasize and remind the nation of the essential nature of this righteous practise at least to the Levites who originated the tunes. The chapter in which these verses appear also covers; the 42 journey’s of Israel on their exile from Egypt to Israel; their momentary disobediences and the character of their resulting long term enemies; the land boundaries of Israel; details of leadership and tribal inheritance; the land to be set aside for Levite priests; the requirement of witnesses for murder; the cities of refuge for the protection of accidental homicides and; the recognition of women's rights of inheritance. In the Book of Esther 7:9 Yerach ben Yomo followed by Karne Parah simply reads, “Behold the gallows made by Haman for Mordecai, who spoke well for the king, were standing in Haman’s house, fifty cubits high!” And the king said, “Hang him (Haman) on it!” Here perhaps the trope highlights that its not over till its over, or the threat can disguise the opportunity or what goes around, comes around. In Genesis 19:16, on the word "VaYitmah'maH" (and he lingered), when Lot was lingering in Sodom as it was marked for destruction, to show Lot's uncertainty. In Genesis 24:12, on the word "VaYomar" (and he said), when Abraham's servant Eliezer was trying to find a woman (other than his own daughter) to marry Abraham's son Isaac. It indicates the hesitation of the servant to pass over his daughter. In Genesis 39:8, on the word "VaY'maen" (and he refused), during Joseph's attempted seduction by Potiphar's wife, to indicate Joseph's struggle against temptation. In Leviticus 8:23, the Shalshelet is used on the word (VaYishlach (and he slaughtered) when Moses was slaughtering an animal in preparation for the anointment of his brother and nephews as priests, a position he coveted for himself. Each incident above reflects a moment of self-struggle and each verb is preceded by “and” as if to say without it the outcomes would have been different. Each highlights a victory over temptation that would otherwise have surely changed the course of Israel’s dynasty. Our final tune of note is the Mercha kefula meaning double comma, which appears five times. Genesis 27:25 - and he brought (ל֦וֹ) to him wine and he drank, when Jacob deceived his father and obtained blessings he traded from his older brother. Exodus 5:15 - why (תַעֲשֶׂ֦ה) do (you) do with your servants this way, when the Israelites complained to Pharaoh who was inflicting them with hard labor. Leviticus 10:1 - strange fire they had (לֹ֦א) not been commanded to bring, when Nadav and brother Avihu elatedly brought offerings in their stupor. Numbers 14:3 - were it not (ט֦וֹב) better for us to return to Egypt, when early in their exile, the spies returned and made a discouraging report about the challenges ahead causing Israel to stay in exile. Numbers 32:42 - and called (לָ֦ה) to it Nobah after his own name, when the tribe of Menashe settled the land on the opposite side of the Jordan River. Perhaps the acts of deception, punishment, transgression, regression and secession expressed using the Mercha kefula instruct future generations about redemption. In summary, heralding priestly rights, resisting temptation and the tribulations that slow redemption are emphasized week after week, year after year in the reading of Torah to Jewish communities the world over. For one reason or another these tunes survived thousands of years to emphasize these words, sentences and verses.